Obviously the market did not take too kindly to the non-farm payrolls, but after all was said and done, the market held its own and even showed a positive bias. The negative trend is still intact, and I do not know how much of a positive bias the market can have with out the support of the semis. Combining these factors makes me think the market chills around here for the time being until a positive catalyst is presented. 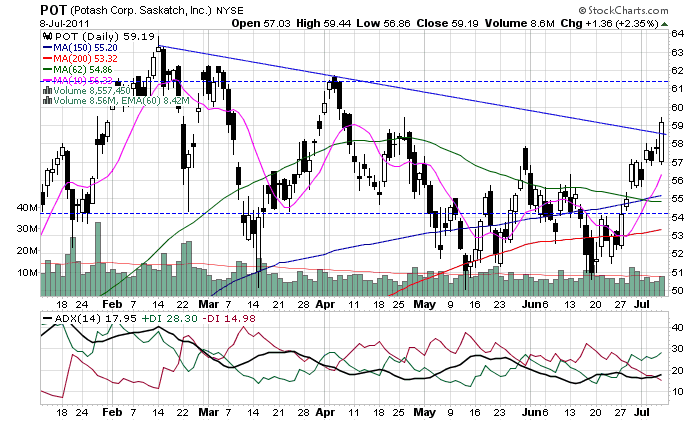 I am hoping this set up will provide a nice buying opportunity for stocks that have been running. 1. POT may be isolated from this consolidation as it broke-out on Friday, with a very bullish undertone via the DMI. I am thinking it approaches mid 61 quickly. I will re-enter the positions I unloaded upon any, and I mean any, pull back. 3. After GOOG reports, it should trade between 530-580 over the next three months. (As per its trailing PE trading range, and affects of it 'getting' social.) 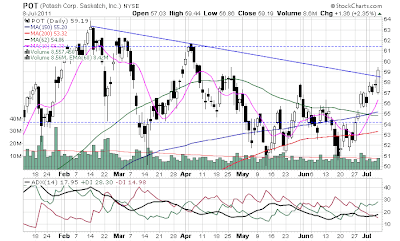 I entered a very light position on Friday, with the downgrade. I will add to the near the low/mid 520s.